This is important and so I want to share it with you. If you’ve never been to a protest march, you might wanna give it a try. Protests are interesting. They are living, amorphous bundles of energy. I went to one last week…here in Charlotte…when all this pain and agony first erupted. I’m not gonna lie. I was scared. Scared to death actually. I know this sounds crazy; but I looked both of my kids in the eyes before I went and told ’em how much I loved ’em. I was met by my friend Toussaint Romain. And when I got there he outlined the mechanics of a protest. The crowd marches down the middle of the road and the police stay way off to the sides. They are on bikes and they morph and flex and dance around the edges. The whole thing is like one big moving living amoeba. It was beautiful actually. An unspoken respect and understanding between the protestors and the cops. At one point during the marching and chanting, the crowd stopped. People were up against people. The chanting continued, yet now all that energy felt stuck and rising and building. It’s amazing the difference I felt almost immediately within my own being. As long as we were moving I felt safe. When, we stopped I did not. How beautiful and respectful it is when we give plenty of room for people to be angry, enraged, to say what they need to say. To not just hold the space BUT CREATE IT. But also how unhealthy it can be when we create the space but then stop moving, evolving, going forward. How all that anger and rage and frustration gets bottled up when we get stuck, cordon it off…when we don’t give it room to move…to transform…to DO something. 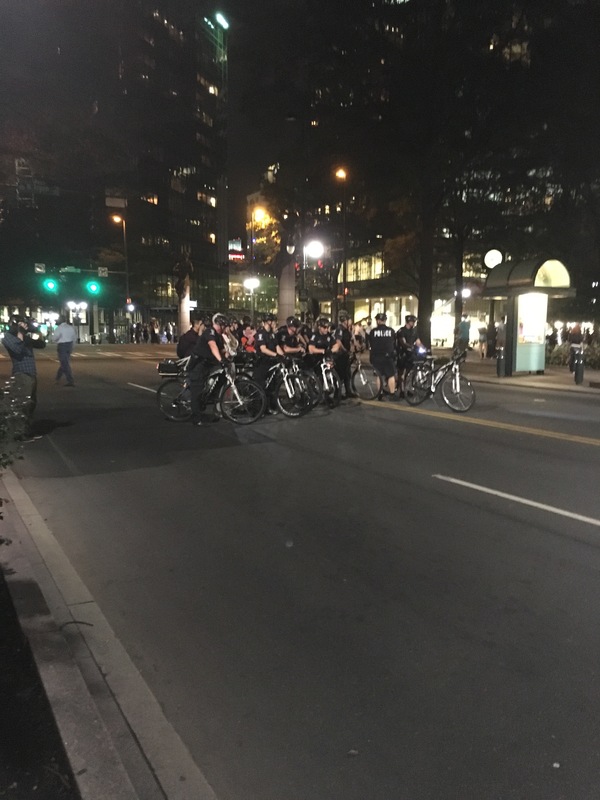 As the crowd congregated on the corner of Trade and Tryon…stopped the moving, the marching, the chanting…the voice of one policeman sounded loud as it pulled from his bullhorn.